I mean, I guess it’s customarily the man’s job to grill so it may not seem like such a stretch that I haven’t dealt with a brisket on my own before, but it seemed odd to me as I stood at the meat case trying to find a piece of brisket that wasn’t 10 lbs. Thankfully, I found a nice little 2 1/2 lb chunk that would be just perfect for this recipe. Whew! Having never cooked a brisket before in the traditional manner, I had no idea what to expect from one cooked in the crock pot. But, Shawnda has never steered me wrong before and I had total faith that the end result would be phenomenal. And. It. Was. Not only was the brisket itself delicious, but the Mango BBQ sauce and the two cheeses made it fan-freaking-tastic!! J was a big fan as well…had them for dinner, and then lunch the following day. Yuuuu-um! I’ve had these pinned for a long time, but don’t wait as long as I did to make them!! Rub the brisket with salt, pepper, chili powder, and garlic,and place in the crock pot. Pour the Dr. Pepper on top, cover, and cook on low for 8 hours. Remove from the crock pot and let rest for 15 minutes before slicing or shredding. Meanwhile, heat olive oil in a 2 quart sauce pan over medium heat, and saute the onions for about 5 minutes. Add the garlic and cook an additional 30 seconds. Add the ketchup, lemon juice, Worcestershire sauce, mustard, mango chutney, and salt and pepper. Stir and simmer for 5 minutes. Transfer the mixture to a blender or food processor and blend until smooth. To make the tacos, heat a large skillet over medium-high heat and spray with cooking spray. 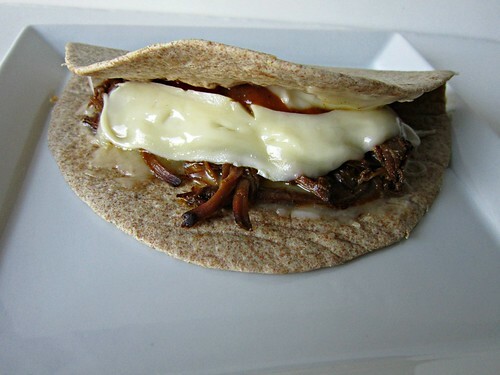 Place meat, brie, and Monterrey jack cheese on one side of each tortilla. Add a spoonful of the mango bbq sauce, and fold the other side of the tortilla over the top, creating the taco. Place the tacos, one at a time, on the heated skillet and cook until the bottom is browned. Flip and cook until the bottom is browned and the cheese is melted. Remove from heat and serve with extra barbecue sauce. Brisket, monterey jack and mango chutney? Yum! I love the combination and it looks fantastic! Thanks for sharing! YAY! The return of Taco Tuesday! I have made this a few times and love it!